How a person spends their money can be a strong indication of what that person is like. Some spend their cash on multiple apartments in different cities. Some buy one giant house in the middle of nowhere. Some purchase companies or invest, hoping to save their estates for their heirs. And then there is our type of person: the ones that spend all of the free time and money on cars. There is a love that can bring people from all different circles to one comfortable place: behind a steering wheel. Stars know how to keep up appearances. So while there are designer clothes and high-end gadgets at their disposal at all times, they cruise around in swanky, imported cars. Indian celebs are no different when it comes to spending on luxury cars many of Bollywood beauties love driving in luxury, and by luxury we mean some very expensive and cool rides like Priyanka Chopra has a Porsche, Katrina Kaif has a passion for F1 and owns a full-size luxury SUV Audi Q7, Kareena Kapoor owns an SUV Lexus LX 470, Kangna Ranaut bought herself a BMW 7 Series and Bipasha Basu has brand new Beetle that she calls 'Brad'. 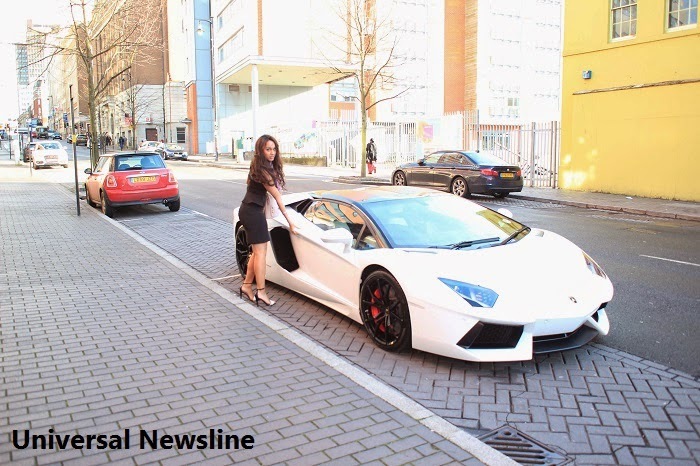 Recently Reality TV star Miss India UK Deana Uppal got a brand new White Lamborghini Aventador Roadster where she was arrested for driving in speed Deana was spotted cruising in her beloved car around the streets of London. This busy woman has just finished the action packed fear factor “Khatron ki Khaladi” where she has overcome her fear and also has a new movie coming out on April 25th called Revolver Rani, starring Kangana Ranaut and Vir Das. She was also shooting a film in jaipur named Life Non Veg. The film is a comedy with Deana as the main lead with VJ Siddharth Bhardwaj.